The Pag-IBIG financing program is available to condominium units at The Cambridge Village, an 8-hectare mid-rise development along East Bank Road in the Pasig-Cainta area, which offers ready-for-occupancy properties ranging from studio, loft-type to two-bedroom suites. 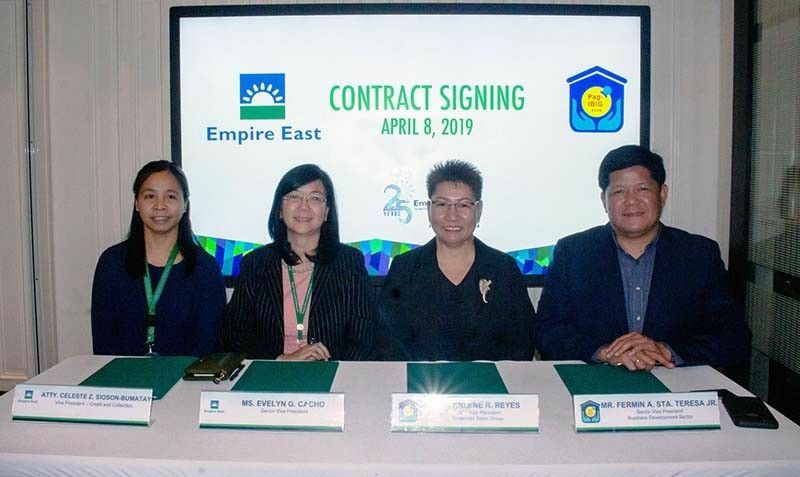 MANILA, Philippines — Real estate developer Empire East and development fund company Pag-IBIG held a ceremonial contract signing for a more feasible monthly payment option for aspiring homeowners, last April 8 at at the Uptown Mall, Taguig City. Attended by Empire East Vice President for Credit and Collection Atty. Celeste Sioson-Bumatay and Senior Vice President Evelyn Cacho, and Pag-IBIG OIC-Vice President for Corporate Sales Group Arlene Reyes and Senior Vice President for Business Development Sector Fermin Sta. Teresa Jr., the event marked a first in the company’s payment alternative, which discerning homebuyers have been appealing for. "We are pleased to announce that this partnership with Pag-IBIG allows lower monthly amortization at more feasible terms—a great support for our current homebuyers who wish for a wider selection of payment options that also give importance to value for money,” said Empire East Senior Vice President Evelyn Cacho. Currently, the Pag-IBIG financing program is available to condominium units at The Cambridge Village, an 8-hectare mid-rise development along East Bank Road in the Pasig-Cainta area, which offers ready-for-occupancy properties ranging from studio, loft-type to two-bedroom suites. Empire East is known for developing unique residential concepts that serve the ever-evolving clients' needs and demands for holistic development while keeping their luxury and comfort. Some of their current and upcoming projects are TODs Pioneer Woodlands in Mandaluyong and San Lorenzo Place in Makati, as well as Urban Resort Residences such as The Rochester and Kasara Urban Resort Residences in Pasig. Know more about Empire East by visiting the website or calling (02) 810-3333 to inquire.